The door itself isn’t the view, it’s the weird and neat doorknob that is attached. When approaching this newest gadget you can glimpse a view of what is contained in the room behind it. You would expect this sort of spy ware in a James Bond movie, but it is very real and can be installed on any door. I can see the benefits of this neat doorknob when coming home late, but can you imagine having it on a bedroom door. 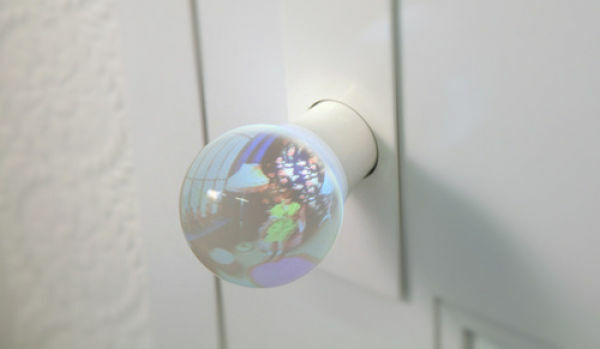 The knob was designed by LEVER and gives you a birds eye view of the room behind it. It sets the items and people behind the door in a haze, sorta like looking into a crystal ball. You can see this doorknob at the display at the Plain People store in Aoyama, Tokyo. Learn Something: The song “Behind Closed Doors” was written in 1973, by Kenny O’Dell and sung by country singer Charlie Rich.